Our dedicated and knowledgeable Pharmacy team has over 45-years of combined recruitment experience within the industrial, government and private sectors, supplying some of the most trusted pharmacy staff. An in-depth understanding of what it takes to find the right professional for the job is what sets this team apart and makes them a priceless component of Immploy. We pride ourselves on our success in tailoring our services to meet the unique requirements of each of our clients. Our support team is available on a 24/7 basis, ready and waiting to lend a hand should the need arise. 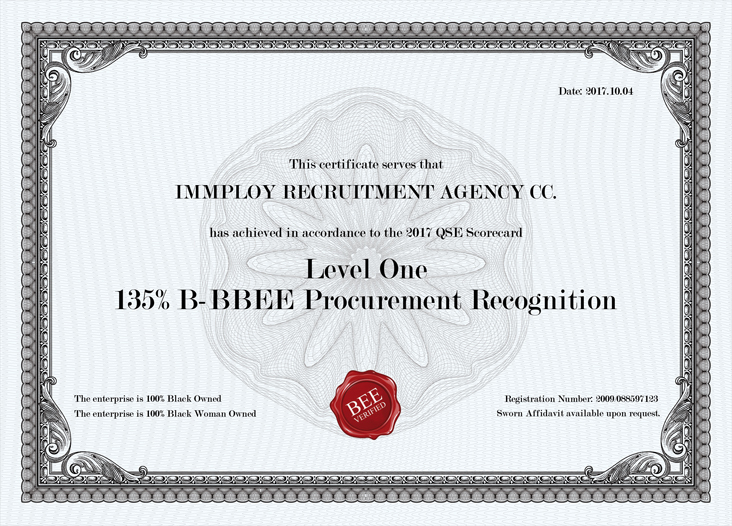 Immploy Recruitment currently has a BEE level 1 status and is a proud member of the Federation of African Professional Staffing Organisation (APSO). All consultants adhere to the APSO Code of Ethics. We strive to be the leading supplier of locum and permanent doctors, nurses, pharmacists and other healthcare professionals to enrich the quality of life for all South Africans by providing the best healthcare staff possible.